Expand your culinary horizons with Ecuadorian Humitas! 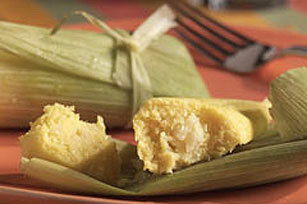 You'll love these buttery, cheesy cornmeal Ecuadorian Humitas prepared in corn husks. Remove green husks and silk from corn, being careful to keep husks whole. Discard silk. Place husks in large pot of boiling water and blanch 1 minute. Remove from water; drain. Place 2 of the corn husks on work surface, with long sides slightly overlapping. Spoon 1/4 cup of the corn puree onto bottom half of the husks; fold the top of the husks over the filling. Fold in half from the left side, then fold in half again from the right side. (One end of each humita should remain open.) Repeat with 34 of the remaining corn husks and remaining corn puree. Keep folded ends in place by tieing closed with thin strips of the remaining corn husks. Fill a large pot with 2 cups water. Line steamer basket with half of the leftover corn husks; place in pot. Stand the humitas, open ends up, in the basket; cover with the remaining corn husks. Cover the pot with a lid. Bring water to boil on high heat. Reduce heat to low; steam 30 minutes or until humitas are firm. Spend time with your loved ones making these humitas, then enjoy one serving as a reward for your work. Ecuadoran cooks place a coin in the bottom of the pot before adding the steamer filled with humitas. The coin noisily vibrates on the bottom of the pot as the water simmers. The coin stops making noise when all the water has evaporated. This tells the cook that additional boiling water is needed. Dry corn husks can be used instead of the fresh corn husks. Blanch in boiling hot water, then use as directed. Makes 9 servings, 2 humitas each.